Looking for a classic look that also pairs nicely with your modern cut suits? 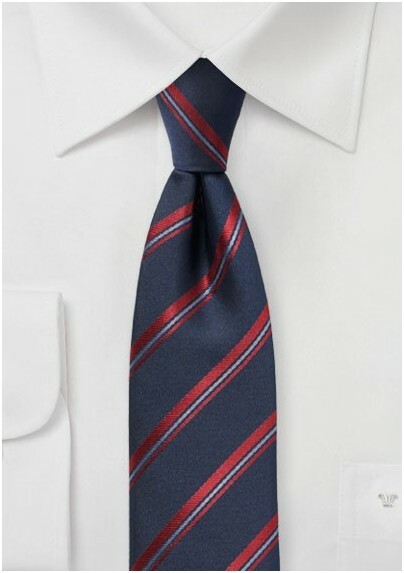 Then this dark midnight blue and cherry red striped skinny tie would make for the ultimate accessory. While the colors are classic and easy to match, it is the combination of skinny cut and the trendy striped design that makes this accessory stand out. 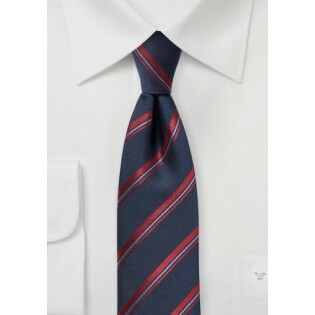 A great tie for today's man in combination with suit colors navy, gray, charcoal, stone, olive, and black. Made by hand from woven microfiber.